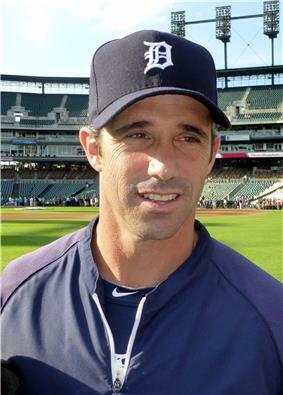 Bradley David "Brad" Ausmus (; born April 14, 1969) is a former catcher in Major League Baseball, and the current manager of the Detroit Tigers. 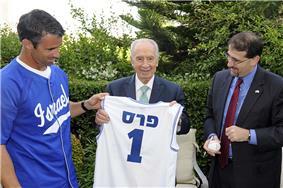 He has also previously managed the Israel national baseball team. Ausmus spent five years in the Yankees' minor league system with the Colorado Springs Sky Sox) before he was traded to the San Diego Padres with Andy Ashby and Doug Bochtler for Bruce Hurst and Greg Harris in July 1993. Ausmus, Brad (June 12, 2007). "You guys just can't get enough". ^ a b SportsJustice: Scrapiron speaks. I listen. Ausmus is funny.. January 27, 2007, Retrieved July 23, 2008. ^ a b Baseball Almanac: Darryl Kile Award. Retrieved July 23, 2008. ^ a b c d Corey Brock (November 16, 2010). "Padres hire Ausmus as special assistant". MLB.com. Retrieved November 22, 2010. ^ "Brad Ausmus Statistics and History". Baseball-Reference.com. Retrieved November 18, 2010. ^ a b c d e Peter S. Horvitz, Joachim Horvitz (2001). The Big Book of Jewish Baseball: An Illustrated Encyclopedia & Anecdotal History. SP Books. ^ Howard A. Megdal (January 22, 2009). "Brad Ausmus: Modern-Day Moe Berg". The Baseball Talmud. Retrieved March 16, 2010. ^ a b "Greenberg, Brad A., There's a new Jew in Dodger blue," Jewish Journal of Greater Los Angeles". Washington Jewish Week. July 1, 2009. Retrieved March 18, 2010. ^ Jewish Major Leaguers Career Leaders. Retrieved July 23, 2008. ^ a b c d e "Brad Ausmus Statistics and History". Baseball-Reference.com. Retrieved November 22, 2010. ^ "Brad Ausmus named Tigers' next manager". Sporting News. November 2, 2013. Retrieved November 4, 2013. ^ David J. Goldman (2006). Jewish Sports Stars: Athletic Heroes Past and Present. Kar-Ben Publishing. Retrieved August 23, 2011. ^ Baseball Digest. Retrieved August 23, 2011. ^ John Solomon (October 25, 1998). "Honoring, Yes, the Jewish Athlete". ^ Greenberg, Brad A. (May 27, 2009). "The New Jew in Dodger Blue". Jewish Journal. Retrieved August 23, 2011. ^ "Marriage Announcement 17 -- No Title". Boston Globe. June 16, 1963. ^ "Three Wise Men". Sports Illustrated. June 5, 2006. Retrieved March 16, 2010. ^ David Borges (July 22, 2012). "Brad Ausmus connects with Jewish roots as manager of Team Israel for the WBC". New Hampshire Register. Retrieved November 4, 2013. ^ "Liz Ausmus- Detroit Tigers Brad Ausmus’ Wife". ^ Baseball Digest. Retrieved March 16, 2010. ^ "Astro Ausmus Sky-High on Shot at Series". Record-Journal. October 21, 2005. Retrieved November 5, 2013. ^ a b "SN names the 20 smartest athletes in sports". Sporting News. September 23, 2010. Retrieved November 5, 2013. ^ "Brad Ausmus". Baseball Library. Retrieved August 23, 2011. ^ Schlossberg, Dan (2007-04-01). Baseball Gold: Mining Nuggets from Our National Pastime. Triumph Books. p. 114. ^ White, Paul (September 1, 2009). "Intelligence report: Baseball's whiz kids stand out, to a degree". USA Today. Retrieved November 4, 2013. ^ "Ivy League Sports". Ivy League Sports. Archived from the original on August 14, 2007. Retrieved March 18, 2010. ^ "Ivy League Sports". Ivy League Sports. Retrieved March 16, 2010. ^ "Retrosheet Boxscore: Chicago Cubs 8, San Diego Padres 6". Retrosheet.org. July 28, 1993. Retrieved March 18, 2010. ^ "Late and close". Baseball Dictionary and Research Guide. Retrieved March 18, 2010. ^ a b c Alyson Footer (October 30, 2007). "Major League Baseball News". Mlb.com. Retrieved October 7, 2010. ^ Alyson Footer (April 16, 2008). "Why aren't catchers pitching coaches?". Mlb.com. Retrieved March 16, 2010. ^ Fraley, Gerry (March 28, 2008). "Yanks' Girardi credits Colorado years : Rockies". The Rocky Mountain News. Retrieved March 16, 2010. ^ Alyson Footer (July 18, 2007). "Major League Baseball News". Mlb.com. Retrieved March 18, 2010. ^ "Ausmus gets one-year, $2M deal to return to Astros". ESPN. October 30, 2007. Retrieved March 18, 2010. ^ "Cleveland Sports". Cleveland.com. Retrieved August 23, 2011. ^ "Astros send struggling catcher Towles down to minors". Houston Chronicle. June 6, 2008. Retrieved March 16, 2010. ^ a b "Ausmus extends career by catching on with Dodgers". Los Angeles Daily News. Retrieved March 16, 2010. ^ "Astros Notes: Moehler subs for Oswalt". Houston Chronicle. July 13, 2008. Retrieved March 16, 2010. ^ "Astros Notes: Brother of pitcher Wolf umps game". Houston Chronicle. August 13, 2008. Retrieved March 16, 2010. 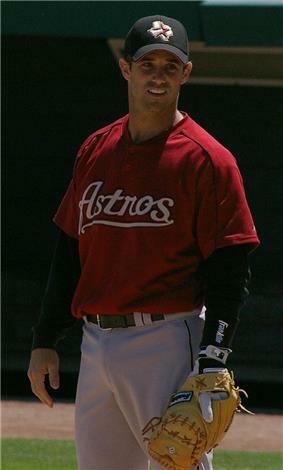 ^ "Astros Notes: Ausmus in last season with team". Houston Chronicle. August 20, 2008. Retrieved March 16, 2010. ^ "Padres prune 40-man roster by five, cut loose Bard and Estes". SignOnSanDiego.com. October 6, 2008. Retrieved March 16, 2010. ^ Alyson Footer (August 20, 2008). "Ausmus' time with Astros nearing end". mlb.com. Retrieved March 16, 2010. ^ "Houston Astros vs. New York Mets". FOX Sports. Retrieved March 16, 2010. ^ "Dodgers agree to terms with Brad Ausmus on one-year contract". mlb.com. January 26, 2009. Retrieved March 16, 2010. ^ a b "Dodgers sign Brad Ausmus to one-year contract; Three-time Rawlings Gold Glove catcher to return to Los Angeles for his 18th Major League season". mlb.com. January 26, 2010. Retrieved March 18, 2010. ^ "Brad Ausmus joins Padres Front Office" (Press release). MLB.com. November 16, 2010. Retrieved November 22, 2010. ^ "Dodgers agree to terms with Brad Ausmus on one-year contract". MLB.com. January 26, 2009. Retrieved March 18, 2010. ^ , October 5, 2009, accessed October 6, 2009LA Daily NewsPadilla, Doug, "Dodgers catcher Ausmus is manager for a day,"
^ "Brad Ausmus". Baseball-reference.com. October 6, 2009. Retrieved March 18, 2010. ^ a b Ken Gurnick (January 26, 2010). "Ausmus comes to terms with Dodgers; Backstop agrees on one-year deal with option for 2011". MLB.com. Retrieved March 18, 2010. ^ "Ausmus returns to Dodgers". ESPN. January 26, 2010. Retrieved March 18, 2010. ^ "2010 National League Awards, All-Stars, & More Leaders". Baseball-Reference.com. Retrieved November 22, 2010. ^ Ken Gurnick (April 10, 2010). "Back issue sends Ausmus to DL". mlb.com. Retrieved October 7, 2010. ^ "Los Angeles Dodgers' Brad Ausmus at ease as manager". ESPN. October 2, 2010. Retrieved November 22, 2010. ^ Sarah D. Morris (March 27, 2009). "Sarah's Take: Dodgers upgrade bench". MLB.com. Retrieved March 16, 2010. ^ Making Airwaves: 60+ Years at Milo's ... Retrieved March 16, 2010. ^ "SN names the 20 smartest athletes in sports". Sporting News. September 27, 2010. ^ a b "SN names the 20 smartest athletes in sports". Sporting News. September 23, 2010. Retrieved November 4, 2013. ^ "A-Rod has time to turn it around". ESPN. February 15, 2009. Retrieved March 16, 2010. ^ Astros Notes: Pence sprains wrist. Houston Chronicle. ^ Footer, Alyson (March 24, 2008). "Ausmus to be emergency infielder". MLB.com. Retrieved March 16, 2010. ^ "Astros summary: Cruz gets start". Houston Chronicle. April 4, 2008. Retrieved March 16, 2010. ^ "Mariners | Another collapse for Mets in finale". Seattle Times. September 29, 2008. Retrieved March 16, 2010. ^ Martino, Andy (April 17, 2009). "Series preview: Brewers at Mets". New York Daily News. Retrieved March 16, 2010. ^ "Astute Ausmus Frames Future In Baseball". Courant.com. Retrieved March 18, 2010. 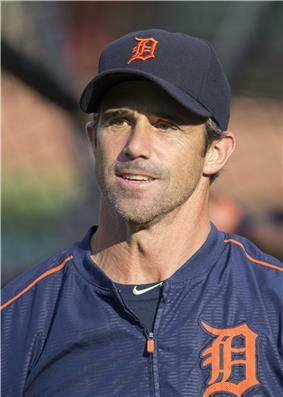 ^ Tigers announce Brad Ausmus as manager with three-year deal Matt Snyder, CBS, November 3, 2013. ^ Last-Place Detroit Tigers Face Uncertain Future Noah Trister, CBS, October 5, 2015. ^ "Brad Ausmus". Baseball Reference. Sports Reference LLC. Retrieved October 5, 2015. ^ Cling Cooper (February 23, 2013). "Faith Focus: Ex-Lookout stoked by Israel trip". timesfreepress.com. Retrieved March 14, 2013. ^ "World Baseball Classic: Israel, managed by Bra". Sporting News. May 21, 2012. Retrieved March 14, 2013. ^ Jeremy Fine. "Beginning of the Season MLB Headlines". The Great Rabbino. Retrieved July 16, 2011. ^ Sammy Hudes (July 12, 2010). "Jews to Play in Baseball All-Star Game". Shalom Life. Retrieved November 4, 2013. ^ Jorge Castillo (March 3, 2013). "Mets' Q-and-A with utility player Josh Satin". The Star-Ledger. Retrieved April 8, 2013. ^ "Astros select Fields, Freiman in Major League portion of Rule 5 Draft" (Press release). mlb.com. December 6, 2012. Retrieved March 12, 2013. ^ "Jewish Sports Hall of Fame And Museum: Brad Ausmus". Jewishsports.org. Retrieved March 18, 2010. This chapter in Ruttman's oral history, based on a February 29, 2008 interview with Ausmus conducted for the book, discusses Ausmus's American, Jewish, baseball, and life experiences from youth to the present.